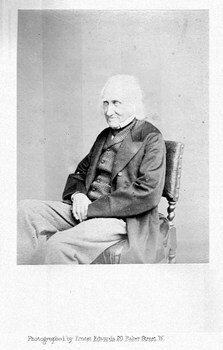 A CDV photograph of Charles Knight in old age, circa 1865. Charles Knight's father, also Charles, kept a bookshop at 2, Castle Hill so Charles grew up with the printed word all around him. He and his father founded the Windsor and Eton Express newspaper in August 1812 and in his 30s and 40s Charles became well known for his Penny Magazine published between 1832 and 1846, plus a number of publications for the Society for the Diffusion of Useful Knowledge (SDUK, founded 1826) but it is said 'his heart was too warm for trade' and he profited little from his work although his business generally prospered. He strove to publish quality works cheaply for the newly literate working class despite punitive overheads such as the Paper Tax. 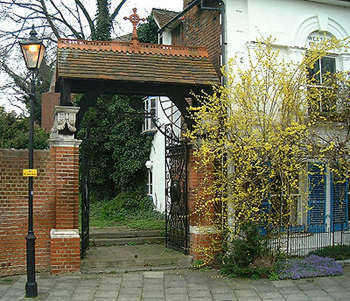 Charles Knight died in 1873 at Addlestone and he was buried in the cemetery adjacent to Bachelors Acre, Windsor, where a gateway was erected in his memory. The photograph is 7 X 9 cm. Note that he is wearing the same clothing and seated in the same chair.